"Flying dragon" redirects here. For other uses, see Flying dragon (disambiguation). "Flying lizard" redirects here. For other uses, see Flying lizard (disambiguation). Draco taeniopterus in mid-glide, from Bulon Island, Thailand. Draco is a genus of agamid lizards that are also known as flying lizards, flying dragons or gliding lizards. 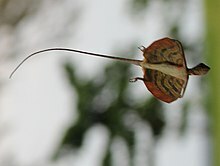 These lizards are capable of gliding flight; their ribs and their connecting membrane may be extended to create "wings" (patagia), the hindlimbs are flattened and wing-like in cross-section, and a flap on the neck (the gular flag) serves as a horizontal stabilizer. Draco are arboreal insectivores. While not capable of powered flight they often obtain lift in the course of their gliding flights. Glides as long as 60 m (200 ft) have been recorded, over which the animal loses only 10 m (33 ft) in height, which is quite some distance, considering that one of these lizards is only around 20 cm (7.9 in) in total length (tail included). They are found in S. Asia and are fairly common in forests, areca gardens, teak plantations and shrub jungle. The only time a female flying lizard ventures to the ground is when a female is ready to lay her eggs. She descends the tree she is on and makes a nest hole by forcing her head into the soil. She then lays 2–5 eggs before filling the hole. She guards the eggs for approximately 24 hours, but then leaves and has nothing more to do with her offspring. Carl Linnaeus derived the name of this genus from the Latin term for mythological dragons. Nota bene: a binomial authority in parentheses indicates that the species was originally described in a genus other than Draco. The lizards are well known for their "display structures" and ability to glide long distances using their wing-like, patagial membranes supported by elongated thoracic ribs to generate lift forces. The India flying lizard is capable of gliding from tree to tree found in the Western Ghats and hill forests of southern India. The Flying Dragon Lizard avoids danger by opening two large, winglike flaps of skin and steers, brakes with its tail. Draco dussumieri features prominently in Poornachandra Tejaswi's Kannada novel Carvalho (ಕರ್ವಾಲೊ). In this story, middle aged scientist Carvalho, searches for this flying lizard (considered very rare in this novel) in the forests of the Western Ghats in the Indian state of Karnataka, and finally the lizard flies down a steep cliff off thick forest. The titular monster from Toho's 1958 film "Varan the Unbelievable" is based on that of a Draco lizard. Xianglong, extinct Cretaceous lizards that glided using their ribs. ^ Beolens, Bo; Watkins, Michael; Grayson, Michael (2011). The Eponym Dictionary of Reptiles. Baltimore: Johns Hopkins University Press. xiii + 296 pp. ISBN 978-1-4214-0135-5. (Draco beccarii, p. 21). ^ Herre, Albert W. (1958). "On the Gliding of Flying Lizards, Genus Draco ". Copeia. 1958 (4): 338–339. doi:10.2307/1439979. JSTOR 1439979.